Dr. Norden is a board-certified ophthalmologist with cornea and refractive surgery fellowship training at the prestigious New York Eye and Ear Infirmary and for years was medical director of the New Jersey Eye Bank. He was the first ophthalmologist in Northern New Jersey to perform LASIK and trademarked Custom LASIK. He has trained hundreds of ophthalmologists to perform LASIK and has lectured nationally and internationally and has published numerous articles in all the most prestigious ophthalmologic journals and has written a chapter on corneal transplantation in a corneal surgery textbook. Super happy, excellent result, great night vision! Amazing experience with Dr. Norden. The best decision I’ve ever made. Great office! Thank you so much for your expertise and skill in restoring my vision. I am so glad I had both eyes corrected and no longer need contacts. my near vision is holding it’s own and occasionally needs a little help. I have let all my friends know of my experience and what a great office you have. Having my laser surgery done by Dr. Norden did change my life, from reviewing patients charts and labs to reading a menu at a restaurant. I have perfect vision now. Dr. Norden is excellent and I highly recommend him. I have always refereed all my LASIK patients to Dr. Norden. When it came time for my nephew, George, a famous opera singer in Romania, to have his procedure and it was a virtuoso performance. Bravo, Dr. Norden! It’s hard to believe that it’s been over a year since my LASIK procedure. it didn’t take long to get used to not wearing glasses or contacts. Whatever fears or concerns that I had about the procedure are a distant memory. As a physician with a little bit of knowledge , it is easy to be fearful, but as one who has worked with the FDA I was very reassured by reading what would be the equivalent of the package insert for the lasses. I feel so fortunate that this technology was available in my lifetime (although I wouldn’t have minded if i could have had it done 30 years ago) I’m sorry that I wasn’t able to attend any of the seminars to discuss my experience, but my life keeps getting more hectic each day. I would be happy to answer any individual questions if you would like. Thank you again for helping me throw away my glasses!!! As a vascular surgeon, my visual skill and precision are critical and cannot be compromised. Dr. Norden clearly is the surgeon’s choice when it comes to LASIK, and I highly recommend him to family and friends alike. The results of my recent laser vision correction have been outstanding. The entire experience from the initial registration and exam, to the operative procedure and to the post-operative care, have been absolutely flawless and outstanding. You have surrounded yourself with an extraordinarily competent and engaging staff in a state-of-the-art facility. When a surgeon choose surgery for himself, it requires a good deal of trust and comfort. Your accomplishments and professional credentials more than fulfil my criteria and I am more than satisfied with the procedure and the results. I must congratulate nor only your surgical expertise, but on the way you manage your eye care centre, which is absolutely first class. Dear Richard, Please note the following: – My son’s delicious smile in the morning – My wife’s beautiful brown eyes at bedtime – Distinct leaves of the foliage – The flight of a golf ball – Crisp stars at night – The address on a house from my car – The face of a patient from WAY down the hall These are some of the wonderful images you have made it possible for me to see the first thing in the morning, the last thing at night, and all the minutes in between. Every one without having to feel around for my glasses, squint, or struggle with lenses. Thank you for that wonderful gift as well as your kindness and professionalism. Having LASIK was one of the best decisions I’ve made. 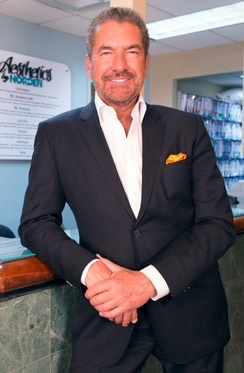 As a Plastic Surgeon my vision is critical to my work and there is no one I would trust more with my vision than Dr. Norden. His expertise and technical skills are astounding. Thanks Rich. Being a plastic surgeon, I need to have precise attention to detail. I would only trust my eyes to Dr. Norden. I must give my whole-hearted thanks to you for the outstading vision I have achieved since you performed my LASIK this past July, 2007. As a cataract and glaucoma surgeon, I had been reluctant to pursue this procedure for years, not wanting to risk my livelihood for “lifestyle purposes” only. But what an improvement in my lifestyle. My return to performing surgery was seamless. I no longer reach for my glasses first thing in the morning (well, I forget occasionally), or have to be troubled with my toddler grabbing them from my face. I am so impressed with the clarity of my vision. Although I was seeking information for my patients when I visited your office, I was sold by the skill and perfessionalism of you and your staff, and the warm atmosphere. Thank you for impressing me enough to make me take this step. Now, when I suggest laser corrective surgery to my patients, I say with the greatest confidence, “Go see the doctor who did mine, Dr. Norden.” They look at my hazel eyes, and nod with approval. A very special not of thanks for the wonderful care that I have recently received from your entire staff and yourself. I really had the opportunity to to anywhere in the country, but chose to see you because of the wonderful reports and reputation that I had heard of. Everything was as I had heard and could have wished for. I would like to thank you for the courtesy, the professionalism, and particularly the expertise. I am delighted with my results and certainly have been very vocal to all of my friends and associates as to the quality of visual enhancement that you would be able to offer tham. I thank you once again for everything and assure you always of my very closest cooperation. I admit I was moe than just a bit anxious. My professional life is intricately entwined with my ability to read and quickly move through regulatory documents. Lynn had a major life improvement after last year’s very successful Monovision procedure by you. But still, a microkeratome & a laser??!!. Botth syes??!! Hmmm…..
From the moment I contacted your practice, the treatment of me as an individual patient and the business face of your practice to me were crisply flawless. I’m a fussy neurologist accustomed to disappointment by medical offices with cold,unsatisfying treatment of patients. No worry, none of that in your practice. Everyone was genuinely warm, personally attentive and exceedingly professional. It’s hard to imagine how your practice avoids falling into dry “reading the menu”, but it clearly feels and projects a patient-oriented, compassionate, technically replete confidence. It also has a subtle sense of humor, taking the edge off anxiety more than somewhat. To the procedure. The LASIK was so easy that my first word off the table was “anticlimactic”. How pleased I was on the morning following my Monovision procedure, when I was comfortably able to read medical journals! Vision is now back to “fighter pilot” and I have bought my first pair of non prescription sunglasses in 25 years. Very cool, super happy. Dr. Norden has been a dear colleague for 20 Plus years. Over that time, I have referred both patients and family members to him for his Lasik expertise and will continue to do so in the future. I continue to see my patients pleased with their results of Lasik both short term and long term. Rich has always impressed me with regards to his desire to learn and improve upon his very wonderful skill. 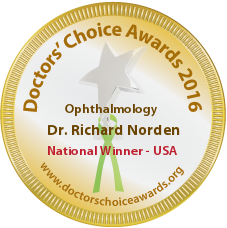 I have been referring Lasik patients to Dr. Richard Norden for over 20 years and have been delighted with his surgical results. My patients have found Dr. Norden and his staff to be extremely professional. My patients and I have been pleased with the quality of the outcome from their Lasik procedures. I’ve been referring my patients to Dr. Norden for over 15 years. His refractive procedures are performed on state of the art lasers with the skill of an experienced surgeon. My patients have been incredibly satisfied with the care they receive from Dr. Norden and his staff. 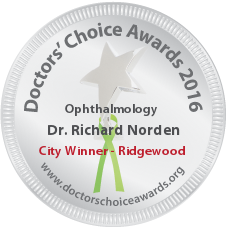 I’ve known Rich Norden for many years as I was his senior resident in ophthalmology. I always knew when it came time for my wife Sonia, to have her LASIK monovision performed, I’d only let Rich do it. Sure enough, when Sonia felt that she hated her contact lenses and glasses too much, recently and asked me for help., I told her that there is only one person I would trust, and that was Rich. He did a fantastic job with her very high prescription and left her glasses-free for both distance and reading!! Thank you, Rich, so much!! As an ophthalmic surgeon in New York City, I’ve had the opportunity to see the top LASIK surgeons operate. When it came time for me to have my LASIK monovision done, my choice was easy. Ten minutes with Dr. Norden and I was freed from my reading glasses. One of the very best things I’ve ever done! What a pleasure! I had my LASIK surgery performed by Dr. Richard Norden almost nine years ago, in August of 2006. As a practicing anesthesiologist and parent of 4 children, I took my decision to have a vision altering surgery extremely seriously. I chose Dr. Norden because of his years of expertise in LASIK surgery and superb reputation. 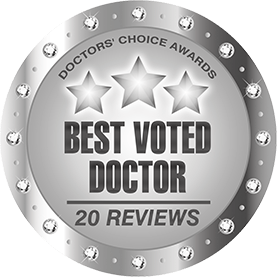 I felt that I selected the most capable physician, who recommended the most appropriate procedure for me, performed it successfully, and then was available and capable of dealing with any complications in the unlikely event they were to occur (they did not). Dr. Norden recommended that each eye be adjusted to a different focal point (mono-vision) so that I would not need reading glasses nor glasses for distance. I have been thrilled with the results for both distance and near vision. I can read very small print even in dim light (eg. menus in dark restaurants), and my distance vision remains excellent. I will be sending my 18 year old son to Dr. Norden in the coming year. Through my several decades of private practice, I have established professional relationships with several physicians, in order for me to provide comprehensive eye care for my patients. For more than 15 years, it has been my pleasure to include Dr. Richard Norden on my list of co-managing physicians. Following a procedure at Norden Laser Vision, my patients return to my practice with enthusiastic accolades for the calming atmosphere of the facility, and the caring staff. Dr. Norden’s years of experience and clinical expertise yields overwhelmingly perfect results, and an overwhelmingly happy patient. I ‘m a very busy optometrist and I adore my patients. I adore my family too. Rich Norden is the only LASIK surgeon that I would ever refer my patients or my family to. 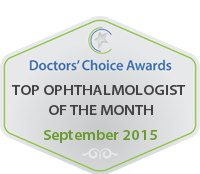 Over the years I’ve sent him all my patients interested in LASIK and my son Andrew and my daughter-in-law Paula too. Don’t walk-run to Dr. Norden for your LASIK. You’ll say it’s the best thing you’ve ever done! I’m an optometric phycisian and among other things, I sell eyeglasses and contact lenses. When someone asks me about LASIK, I never hesitate to recommend Dr. Norden — he’s always done a phenomenal job with our patients and he’s the only one that I would recommend. Thank you for seamlessly guiding me through the LASIK process in such a caring and professional manner. For years I had delayed this decision for a variety of reasons, but mostly work related. As a busy orthopedic hand surgeon, I felt that I could never find the downtime for the pre-op preparation and the post-procedure recovery. Also, there was the general apprehension involved when one’s job includes routinely dissecting the small anatomic structures of the hand and wrist. While researching options for consultations, it quickly became clear that Norden Laser Eye is the healthcare professional’s choice. You came highly recommended by surgeons, operating room nurses, and various other medical practitioners in my hospital, many of whom are themselves highly satisfied postoperative patients. During my first consultation, it was obvious why this practice is so highly regarded. You answered my many questions and assuaged my fears in an intelligent and compassionate manner. A short time later, I underwent a fifteen-minute painless procedure. The very next day Iwas back in my office with 20/15 vision (and no contact lenses!) examining patients. I am grateful that I will never again have to worry about putting in contacts in the middle of the night for an emergency case. Never again will I have to experience the dreaded, irritating “red eyes” that routinely accompanied a long stretch of work while wearing contact lenses. I cannot say enough about the care I have received at Norden Laser Eye Associates. My only regret is not getting this procedure done sooner! I now look forward to my first summer at the beach without contacts, followed by my first lens-free ski run this winter. Thank you, Dr. Norden, and thank you to your excellent, courteous staff. I have already strongly recommended you to friends, family, patients, and colleagues alike, and will continue to do so. I do not have the words to express how much your service and skills are appreciated. As an OB/GYN I spend time in both an office and an operating room. It has been my career and my life for over two decades. For more than 40 years I have been wearing glasses and hated them! I tried contact lenses in my twenties, but could never get used to them. The real problem started when I began needing progressive lenses for my glasses. I would use a different set of glasses at home, in the office, and in the operating room, constantly loosing them. I would drive my anesthesiologist crazy during operations, trying to adjust the table up and down for me to be able to see. It was becoming more and more difficult for me to work, and I would not see myself being unable to do so. I was always afraid to do anything to my eyes that could potentially harm their. This was what scared me most about vision correction surgery. After graduating college, my son chose a military career and became a Marine Officer. He had also been wearing glasses since the first grade. He asked me to find a doctor who could do LASIK for him so he could perform his duties without the hassle of contacts or glasses. Our long time ophthalmologist, Dr.Rosenberg (Chief, Ophthalmology Department, Hackensack University Medical Center) told me with no hesitation: bring your son to Dr. Norden! You hear about parents inspiring their children, my son inspired me. And now, thanks to your talent Incl expertise we both enjoy 20/20 vision without the nuisance of glasses, contacts, progressives! From one surgeon to another, thank you from the bottom of my heart. I am an intensive care physician at NYU. 1am 46 and had been wearing contacts for nearsightedness with significant astigmatism since high school; more recently had noted a definite decline in near vision as well. I found myself squinting at monitiors and flow sheets in the ICU and defintiely was feeling less confident driving. I had been evaluated several times in the past for LASIK and was told I wasn’t a candidate due to thin corneas. I came to Norden Laser Eye expecting the same message but was told that with Dr. Norden’s state-of- the art technology and monovision, I would be a fine candidate for correction of my astigmatism as well as my “near” and ”far” vision. After a remarkably brief and painless procedure and a truly pleasant overall experience, I was immediately able to see better than I had in years (even with contacts). I worked the next day and have been contact and “squint”-free ever since. I just wanted to take this time to thank you and your staff for the wonderful job you did with my LASIK surgery. It was a very easy and positive experience for me. I called and the next week I had an examination and two days later had the procedure. From the moment I entered your office I felt at ease with both you and your staff. The decision to have any type of surgery can cause one to have anxiety but the time you took to explain every detail calmed my nerves and aided my decision to proeced. I am an Anesthesiologist, so my vision is extremely important to me and my career. I wore glasses for 20 years and contacts for 15 years. Prior to the surgery the contacts had become so unbearable I was restricted to wear only glasses. I went through 3 or 4 different contact brands but they all had the same result, only about 6 hours of use with constant irritation of my eyes. You could only imagine how this affected my ability to perform at work. Finally, I decided to have the LASIK procedure in the hopes that it would improve my life by eliminating the need for glasses or contacts. I did my research and as a physician was able to ask my colleagues in the area who they would recommend. It was comforting to know that both my research and the recommendations from fellow physicians led me to the same place, Norden Laser Eye. After reading about your years of experience and meeting you in person I knew it was the right decision. After speaking with you and your staff any doubts or reservations that I had about the procedure were put to rest. I am now 2 months post-LASIK and can honestly say I can see better now than I ever could with glasses or contacts, my night vision has even improved. The procedure itself was a breeze and I was up and driving to my follow-up appointment the very next morning. I highly recommend you and your staff to my fellow colleagues, family and friends on a regular basis. Thank you again for making my everyday life so much easier’ and my vision so much better!